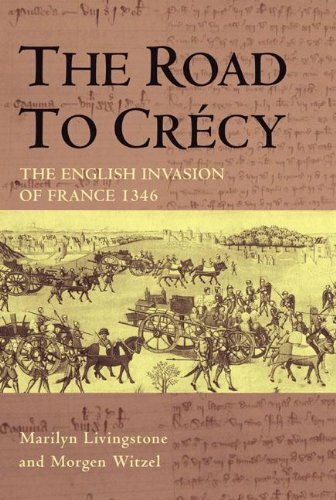 The Road to Crécy tells the story of the English expedition to France in 1346 which climaxed with the battle of Crécy. On 26 August 1346 on a low ridge outside the village of Crécy-en-Ponthieu in northwestern France, an English army of perhaps 12,000 men under the command of King Edward III faced a combined French and German force five times their number under Edward's rival King Philip VI. The result, on the part of the French at least, was seen as a foregone conclusion. The English army, largely composed of foot soldiers and tired after days of marching and fighting, would be ridden down and overwhelmed by the armoured knights of France, then universally regarded as the finest fighting men in Europe. A few hours later, all was over. Thousands of French knights and auxiliary troops lay dead or dying on the slopes of the ridge, shot down as they advanced by English and Welsh archers. King Philip, wounded twice by enemy arrows, had fled the field. The events of those few hours had changed the course of the Hundred Years War, the balance of military power in Western Europe, and the nature of warfare itself.